Batu Caves is a limestone hill that has a series of caves and cave temples in Gombak, Selangor, Malaysia. It takes its name from the Sungai Batu (Batu River), which flows past the hill and also it is the tenth (Pattu in Tamil) limestone hill from Ampang. Batu Caves is also the name of a nearby village. 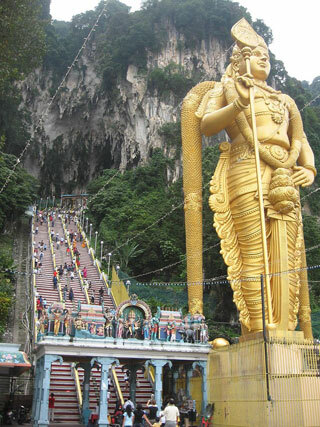 The cave is one of the most popular Hindu shrines outside India, and is dedicated to Lord Murugan. It is the focal point of Hindu festival of Thaipusam in Malaysia. This article uses material from the Wikipedia article "Batu Caves", which is released under the Creative Commons Attribution-Share-Alike 3.0 License.